We often talk at A Plus Garage about the safety of your garage and ensuring that the garage door functions properly for you. Although this is crucial, and one of the most important parts of your garage, it is not the only important part. The inside of your garage needs to be maintained, cleaned, and taken care of to ensure no problems will arise inside. These things are not only crucial for the garage itself, but the items inside the garage to keep them in the best shape they could possibly be in. Chances are you’ve stored your lawnmower in your garage for safekeeping during the winter to prevent damage from happening. While it is important to protect this tool from the harsh winds and moisture of winter, that isn’t all that it needs to be protected from. Make sure to drain the fuel from your lawnmower before storing it to ensure it will run when the time comes next summer. Not only will this prevent the fuel from becoming bad over the long winter, but it can reduce the chance of a leak spilling all over the floor of your garage. Keep it clean by taking care of this in advance. By taking this small step you will save yourself time in the long run. The hardest thing for many people to stick to is just getting and staying organized. By taking the little steps in the garage to become better organized, you will save yourself a lot of time rummaging through things, looking for the tools you have lost. 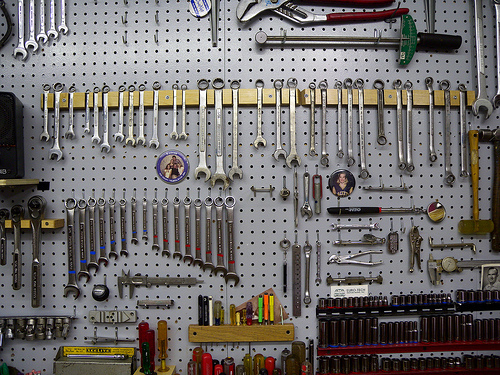 Save yourself some extra money as well by avoiding broken and lost tools by putting everything in its place. Get rid of clutter in your garage that is just taking up space. Make a goal to give your garage a deep clean twice a year, once in spring and once in the fall .This is the time when the winter and summer stuff will either come in, or go out. By doing this, you can decide what you still need, and what can be disposed of. Sweep out the garage and clean the floors with hot water and soap. If you have any oil spots that have come, let them soak overnight to get the best results. The maintenance of your garage door is essential, but so is the rest of your garage. Make sure to take proper care of all throughout the year. This will be beneficial to you in the long run, and make it easier to find specific things inside.